NASHVILLE, TN — Both young women come from the same high school, Martin Luther King Jr. Magnet, in Nashville. 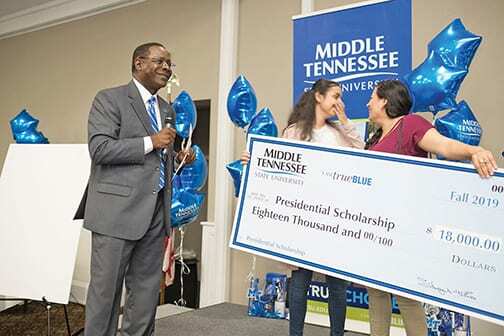 Diana Makram knows she wants to major in biology and minor in chemistry, and walked out of the Middle Tennessee State University True Blue Tour at the Millennium Maxwell House Hotel with an $18,000 Presidential Scholarship. Martina Hannaalla wants to be a physician, following her father’s career path, through the preprofessional route. 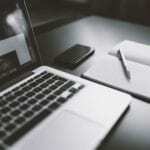 She has the academic credentials (29 ACT and 4.0 GPA) to receive the same scholarship, plus is eligible to apply and be considered for the University Honors College’s Buchanan Fellowship. Nashville was the fourth stop on the annual tour, which also travels across Tennessee and to Kentucky, Georgia and Alabama to recruit prospective students. Several hundred students, plus family members, attended. Students with 3.5 and higher GPAs and scoring between 25 and 29 on the ACT are eligible, but they need to apply by Dec. 1, a deadline MTSU officials continue to push. Makram said she wants to be a physician’s assistant. Walking into the hotel ballroom, her options were primarily between MTSU and a Nashville private university. “Watching the video (about campus) they played and learning more of the school on top of winning the scholarship definitely caught my attention,” she said. “Leaving (the building) definitely made me realize MTSU is the college I want to attend in fall 2019.” She will visit campus for the first time during the Nov. 3 fall preview day. A pending MTSU-Meharry Medical College partnership, which would provide a fast track for students wanting to become physicians, caught her attention. She did an internship with Meharry in the summer of 2017, shadowing doctors, sitting in on clinicals, presenting research and was involved with social media outreach in medicine. Officials with MTSU and Meharry hope the alliance becomes official soon, said Mark Byrnes, MTSU provost. The mission of the partnership would be to provide more primary care physicians in rural parts of the state. Alumna Tandra Martin (Class of 2015) — an Honors College Buchanan Fellow, student ambassador, Fulbright recipient and Rhodes Scholar finalist, among many awards — shared about her many MTSU experiences.